And there's still time to grab these outperforming stocks. I guarantee you've witnessed -- and probably been a part of -- this industry in action within the last week, and probably within the last few hours. It's everywhere, it's growing, and over the past five years, it's absolutely destroyed the market's returns. 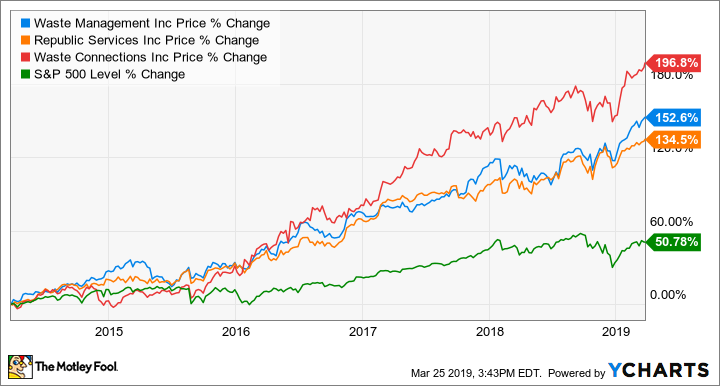 We're making more trash than ever, and the three largest trash haulers and landfill operators in North America, Waste Management (NYSE:WM), Republic Services (NYSE:RSG), and Waste Connections (NYSE:WCN), are reaping the rewards for their investors. Here's why this niche industry outperformed in 2018 and why it's unlikely to slow down anytime soon. The top players in the waste management industry have been handily outperforming the broader stock market. Image source: Getty Images. Source: Company press releases. *YOY = Year Over Year. Although revenue for the three companies only showed small improvements -- if any -- adjusted per-share earnings were up by double digits. Other key metrics like adjusted EBITDA and adjusted free cash flow also showed big improvements over the prior year for all three companies, which are all projecting even better numbers for the next year. If you've noticed that's a lot of "adjusted" numbers, you're right. When we look at unadjusted earnings, we see far less year-over-year improvement, if any. Much of that is attributable to changes in the tax code, with some additional effects from divestitures and asset impairments. Overall, these are strong numbers. And that's not surprising, considering the trends that are affecting all companies in this space. Population increases lead to higher volumes of trash, so the long-term trend of an increasing population helps all three companies. In addition, major natural disasters -- like Hurricane Harvey in 2017 -- seem to be occurring more frequently, resulting in higher amounts of debris removal and needed landfill space. Recent tornadoes in the Southeast and flooding in the Midwest are just two examples. And indeed, volumes -- the amount of trash hauled and put in landfills by the three companies -- are on the rise, although only slightly. Waste Management led the pack with an overall volume increase of 3.3%, while Republic Services and Waste Connections lagged with increases of 0.4% and 0.1%, respectively. Check out the latest earnings call transcripts for Waste Management, Republic Services, and Waste Connections. With such small increases in volume and overall revenue, it's impressive that the companies are able to pump out such big improvements in cash flows and EPS. This is largely due to operational improvements, particularly in recycling. For years, recycling was cheap as China was willing to import large quantities of recyclable plastic. That gave the waste management companies -- which also handle recycling pickup -- a tidy profit on their recycling efforts. But China first limited the amount of recyclable material it would accept, then in January 2018, effectively banned imports of recyclable material altogether. The waste management companies were caught in a bind as recycling commodity prices dropped by more than one-third, and the companies' fixed recycling contracts weren't covering the difference. However, the companies have been able to offset the recycling headwinds through cost-cutting and new fees. Waste Management, for example, has started charging a contamination fee that's generating enough revenue to turn the 2018 recycling headwinds "into a tailwind" for 2019, according to CEO Jim Fish on the most recent earnings call. With all three companies anticipating an even better 2019, now is a great time to consider putting a little bit of trash into your portfolio.